Our new TRX Payment App, TRXpay delivers a modern user-interface (UI), new device integrations, updates to Slingshot, and stability improvements. For merchants using our TRX Payment App, there is now a new version available in the Google Play Store, and Amazon App store. The new version will be available soon for iOS devices in the Apple App Store. After downloading the new TRX Payment App, called TRXpay, the first thing you will notice is a new look. The UI has been updated to provide a more modern look and feel, more in line with some of your favorite apps that you use today. By updating the UI, users should be more familiar with navigating the app and using the new features. 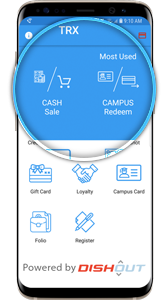 TRXpay supports further branding customization options, including changing the color scheme of the app and icons to match the branding of your business. We understand every business is different. You may use TRXpay to process traditional credit card payments more than anything else. Perhaps you use it to process a lot of campus cards or gift cards. With our new “Most Used” feature, the functions you perform most often are quickly available at the top of page one. There is no set-up required. TRXpay will learn which functions you use frequently, and display them at the top of the app under “Most Used.” This additional feature should allow you to quickly find the common functions you wish to perform, and eliminate wasted time in the transaction process. The merchant experience with Slingshot and TRXpay has been improved to include push notifications. Previously, a clerk at the merchant’s location would enter a customer’s order into the point-of-sale, and the POS sent the order to Slingshot. The clerk would then have to wake the mobile tablet or phone with TRXpay, open the app, and navigate to Slingshot to process the payment. With the latest update, push notifications can automatically wake the mobile device and open TRXpay. Once TRXpay is open, the clerk enters their ID and is instantly brought to the “process” options. This creates a quick, seamless experience as an extension of the POS. Push notifications can improve the payment experience wherever you may accept payments. 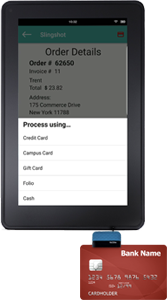 For example, you may have a mobile device running TRXpay at your counter where guests order. This device can display helpful information to your customers as they approach the counter such as daily specials or new offerings. Once the clerk inputs the order into the POS and uses Slingshot to send the order to the mobile device, the device will automatically open TRXpay and be ready to process a payment. While Slingshot can be easily integrated to connect a POS system and TRXpay, the newest update provides integrators with more advanced options. Previously, integrators would “poll” Slingshot on a scheduled interval, such as every 10 minutes, and bring the status of a payment from Slingshot to the POS. With the latest update, integrators can now utilize a callback. When sending an order to Slingshot, integrators can provide a webhook address, and Slingshot will post the status back to that address in real-time. For example, if a callback is used, once an order is paid for, Slingshot can post the status of “paid” to the webhook address to update the POS system in near real-time. Behind-the-scenes, DishOut has created an entirely new profile engine with more customization options and features. This engine will allow resellers of TRXpay tighter control over the release of new features and allows DishOut to provide innovative new features to merchants much faster than before. 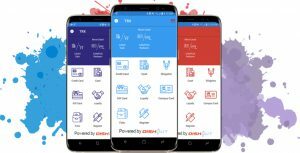 With the new TRXpay, DishOut has performed work to integrate and certify new devices to accept payments. We understand our merchants are eager to begin accepting EMV, or chip card, payments. The new device certifications and integrations will allow us to do just that. For a full list of new devices, stay tuned to this page for updates, or follow us on Facebook, Twitter, or LinkedIn.